I made this for a bridal shower, and it was a hit. 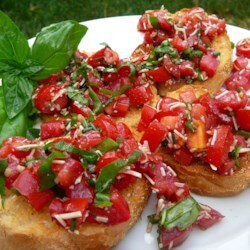 I prepared the tomato mix the night before and toasted the bread about 15 minutes before the party started. I liked the cold mix on the warm bread. I also appreciated that this could be prepared the day before!